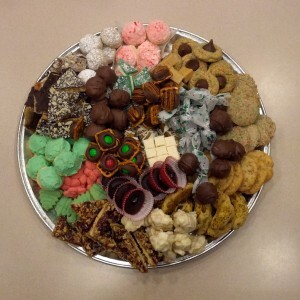 Monday was good day here at TDS because Melynn brought in her cookie platter (and not only did she bring one to work, she also sent one equally large to her husband’s office). I’ve got to say, they were all really tasty. Melynn wasn’t entirely pleased with the texture on the base of the Pretzel Bark, a recipe she tried out for the first time this year. I thought it was good and I told her I’d be happy to take any leftovers off her hands :-). My absolute favorite was the Melting Moment—where have those been all my life? It really did melt in my mouth and the frosting was just the perfect amount of sweet on top. I also liked the Potato Chip Cookie which didn’t taste chippy, but was a nice, crispy cookie. And finally, the Cookie Dough Truffle was as good as you might expect. Hopefully we can get Melynn to share that recipe with us next year! Part 1 of Melynn’s baking adventure and includes recipes for Salted Caramel Pretzel Bark. Part 2 of Melynn’s baking adventure, featuring recipes for Spritz, and Potato Chip Cookies. Part 3 of Melynn’s baking adventure and includes recipes for Peanut Blossoms, Melting Moments, and Pretzel Turtles. Part 4 of Melynn’s baking adventure, featuring recipes for Eggnog Fudge, and Chocolate-filled Russian Tea Cakes.